VietNamNet Bridge - A Singapore company owned by Thailand's richest man wants to acquire Vietnam Dairy Products JSC (Vinamilk) to prepare for its battle for market share with Coca Cola and Pepsi in Southeast Asia, according to Bloomberg news service. Fraser & Neave Ltd. (F&N), owned by Thai billionaire Charoen Sirivadhanabhakdi, is seeking to raise its market share in Southeast Asia after its capital increased to $745 million. Bloomberg quoted F&N CEO Lee Meng Tat as saying that this firm is targeting Vietnam’s largest milk producer - Vinamilk. According to Lee, acquiring Vinamilk would open a shortcut for F&N to expand its operation in Southeast Asia, in the competition with the two giants PepsiCo Inc. and Coca Cola Co.
By the end of June, Singapore-based F&N owned cash and other assets equivalents to $725.3 million after selling its shares in Myanmar Brewery Ltd in late August last year, three years after divesting from Asia Pacific Breweries. F&N’s plan to acquire Vietnam’s Vinamilk is part of a strategy targeting the Southeast Asian market with 600 million people, home to the fastest growing economies in Asia. This firm also plans to build its presence in a number of other markets if it fails to acquire Vinamilk. 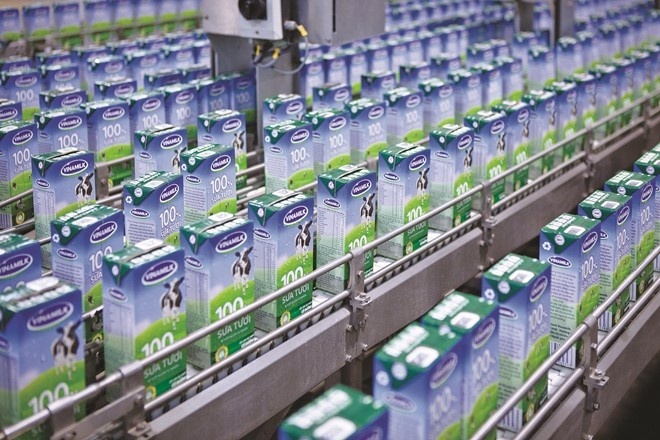 Vinamilk is Vietnam's largest company in terms of market price. Vinamilk's shares rose to a record high price last week after the company was allowed to sell more shares to foreign investors. This company’s share has increased by 32% this year, compared to the average 14% of the Vietnam's stock market. However, Bloomberg cited a local newspaper as saying that Vinamilk is not named in the list of 120 state-owned companies that the State Capital Investment Corporation (SCIC) plans to divest this year. F&N is now the second largest shareholder of Vinamilk with 11% stake. The Vietnamese government holds 45% stake. F&N is one of the three largest beverage manufacturers in Singapore, Thailand and Malaysia, according to Euromonitor International. However, it is not in the top 5 companies in Vietnam, Indonesia and the Philippines, where it is seeking ways to develop. The Thai billionaire has launched a strategy to expand across Southeast Asia following the acquisition of F&N at the cost of $7.84 billion in February 2013. He set a target of making food and beverage subsidiaries of F&N and other companies including Thai Beverage, Semrsuk Pcl and Oishi, the top three leading brands in Southeast Asia in 2020.